The default setup for Weblate is to use python-social-auth for handling new users. This allows them to register using form on the website and after confirming their email they can contribute or by using some third party service to authenticate. You can also completely disable new users registration using REGISTRATION_OPEN. By default Weblate uses Django built-in authentication and includes various social authentication options. Thanks to using Django authentication, you can also import user database from other Django based projects (see Migrating from Pootle). Django can be additionally configured to authenticate against other means as well. Thanks to python-social-auth, Weblate support authentication using many third party services such as Facebook, GitHub, Google or Bitbucket. By default, Weblate relies on third-party authentication services to provide validated email address, in case some of services you want to use do not support this, please remove social.pipeline.social_auth.associate_by_email from SOCIAL_AUTH_PIPELINE settings. Enabling individual backends is quite easy, it’s just matter of adding entry to AUTHENTICATION_BACKENDS setting and possibly adding keys needed for given authentication. Please note that some backends do not provide user email by default, you have to request it explicitly, otherwise Weblate will not be able to properly credit users contributions. Weblate uses privileges system based on Django. The default setup (after you run setupgroups) consists of three groups Guests , Users and Managers which have privileges as described above. All new users are automatically added to Users group. The Guests groups is used for not logged in users. Basically Users are meant as regular translators and Managers for developers who need more control over the translation - they can force committing changes to git, push changes upstream (if Weblate is configured to do so) or disable translation (eg. when there are some major changes happening upstream). To customize this setup, it is recommended to remove privileges from Users group and create additional groups with finer privileges (eg. Translators group, which will be allowed to save translations and manage suggestions) and add selected users to this group. You can do all this from Django admin interface. To completely lock down your Weblate installation you can use LOGIN_REQUIRED_URLS for forcing users to login and REGISTRATION_OPEN for disallowing new registrations. Overwriting existing translations by uploading translation file. 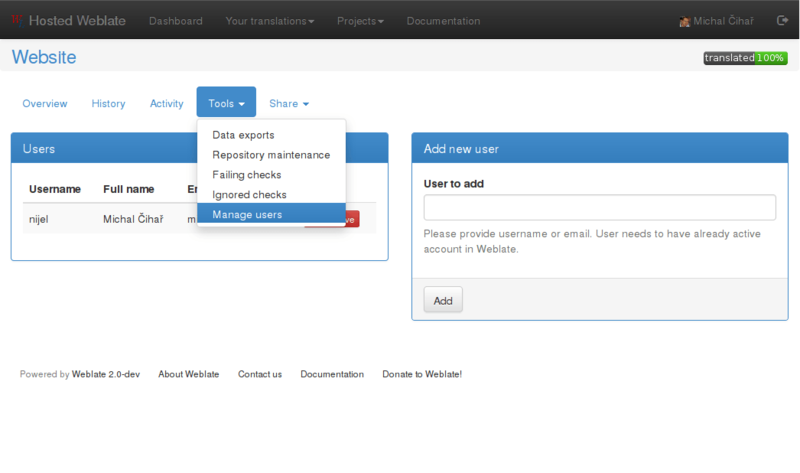 Allows to define custom authorship when uploading translation file. Can force Git commit in the web interface. Can force Git pull in the web interface. Can force Git push in the web interface. Can lock translation for updates, useful while doing some major changes in the project. Can reset Git repository to match remote git. Can save translation (might be disabled with Suggestion voting). Can accept suggestion (might be disabled with Suggestion voting). Can delete suggestion (might be disabled with Suggestion voting). Can vote for suggestion (see Suggestion voting). Can save translation, accept or delete suggestion when automatic accepting by voting for suggestions is enabled (see Suggestion voting). Can import dictionary from translation file. Can lock translation while translating (see Translation locking). Can use machine translations (see Machine translation setup). This feature is available since Weblate 1.4. By enabling ACL, all users are prohibited to access anything within given project unless you add them the permission to do that. Additionally you can limit users access to individual projects. This feature is enabled by Enable ACL at Project configuration. Once you enable this, users without specific privilege (trans | project | Can access project NAME) can not access this project. An user group with same name as a project is also automatically created to ease you management of the privilege. To allow access to this project, you have to add the privilege to do so either directly to given user or group of users in Django admin interface. Or using user management on project page as described in Managing per project access control. All users and groups can be managed using Django admin interface, which is available under /admin/ URL. Users with Can manage ACL rules for a project privilege (see Access control) can also manage users in projects with access control enabled on the project page.